a very simple script. It helps to check and uncheck the Move, rotate and scale axis in Link Info. 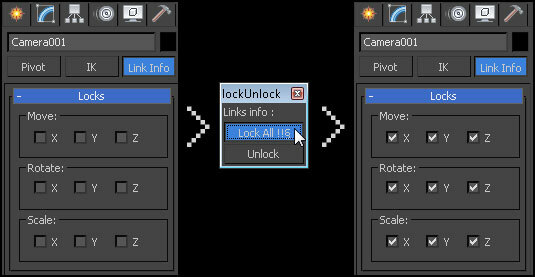 It works with Locks axis and Inherit Axis on all the objects in selection. Same thing when you want to unlock. This script automatically do it for all entries. A little script to lock/unlock the movements of the cameras or objects too. 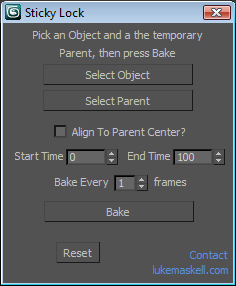 Put into your scripts directory, and under "Customize user inteface" open the category "Maico G." and assign "Lock Camera" to a menu, shortcut or toolbar. To use, select a camera, camera target or an object and click lock or unlock.